It feels like its been a while since a full Floyd concert’cast. I’ve been meaning to feature this one for a long time but kept putting it off. It’s Pink Floyd’s first visit to Atlanta Georgia in ten years. Over a three day period, they filmed and recorded in what was supposed to be a precursor to ‘delicate’. Doctored up and whatnot… Enjoy and thanks for leaving comments! I love them. Don’t stop! Ok, I give up trying to figure this comment out. What are Y’all talking about with the “Hidden” podcast? I wish I could get the podcast app to go back far enough to download this one and the “Sunrise” one within the App. 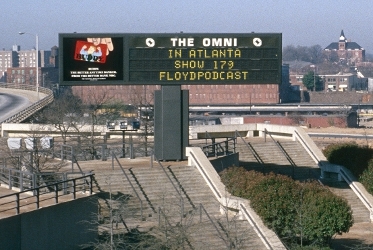 I went to one of these shows in Atlanta. I had to leave the concert and go BACK to work. I’ve had Better ideas than the last part of that before!! There used to be a hidden podcast. Anyway to get the app, you can still manually download any show. what the hell doc?..i dont like puzzles..where the hell is the hidden podcast..if u dont want it on the site email me with instructions…please? ?..pretty please??? Hahaha. Its long gone since i moved to a different host provider. Im trying to figure out how to re-add it. If you email me at thedoctor@floydpodcast.com i’ll send you the link.